Understanding and implementing the ASCA National Model can be challenging. To help you, ASCA recently published “The ASCA National Model Implementation Guide.” This book includes explanations, a list of do’s and don’ts, worksheets, forms and examples for all ASCA National Model components. Beyond the 12 components of the Recognized ASCA Model Program (RAMP) application, the guide also includes tips on analyzing school data for identification of needs, developing effective goals for the school counseling program and creating meaningful perception data plans and tools, as well as resources for finding research-informed best practices. Get an overview of the guide and highlights of some of the tools. Download accompanying handouts. Describe the process of analyzing local school data and developing goals for the counseling program based on needs revealed in the data. 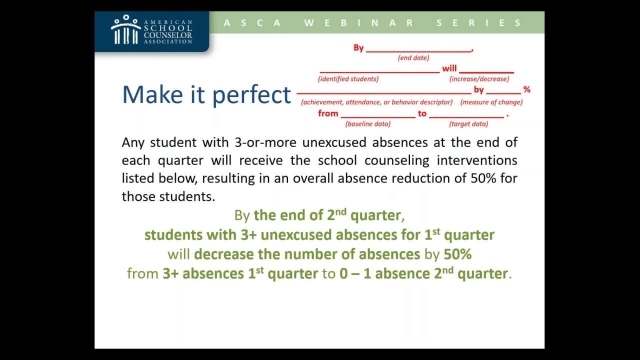 Select relevant ASCA Mindsets & Behaviors for interventions. Use selected Mindsets & Behaviors to drive content and perception data tools for specific intervention. Explain how to develop quality action plans and results reports. Karen Griffith, Ph.D., LPC, is a retired school counselor, with 35 years in public education, and is a part-time faculty member at the University of Georgia. She currently serves ASCA as a lead RAMP reviewer, ASCA National Model trainer and peer reviewer for Professional School Counseling journal.